The Stark Raving Viking: Jill Stein another conspirator in Clinton Coup Attempt? 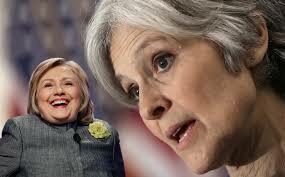 Jill Stein another conspirator in Clinton Coup Attempt? What stinks worse than fish rotting in the sun? Well, Jill Stein asking for a recount in states where the counts were close where Trump won, but not in states where Hillary allegedly won. Stein in her months, and months, to years of seeking funding for her campaign, maybe raised just over 3 million in campaign contributions. If Jill Stein somehow raised over 7 million in just 48 hours to dispute election results in just states that would unseat Trump as President elect, and Stein herself, can't be winning candidate, then this is a criminal conspiracy at minimum. My belief the acts of Hillary Clinton, Bill Clinton, Jill Stein, the current US Attorney General etc. is treason and an attempted coup. George Soros funding Black Lives Matter, an attempted destabilization of the US while supplying alleged rigged voting machines in key states, is an act of war. If these criminals can get away with they're attempting, then the FBI, USDOJ, and "legal system" is a sick joke. The billionaires, their international bankster, and corporate organized crime cronies have spent vast fortunes expecting returns with what they have put into the Hillary Clinton campaign, the Clinton Foundation, and the Clinton Global Initiative (CGI). These donors operate or puppet the major spy agencies, the media, the Central Banks, and those who puppet major military all over the world. To what lengths will these elite, also known as the New World Order (NWO), go to gain the most power and make the most money at our expense? If their isn't some action to deseat US President Elect Donald J. Trump, will Hillary and Bill Clinton have to worry about being whacked, mobster style, for not delivering what they were paid to do? If you're going to rig the US Presidential election, you'd have to consider that the US Supreme Court may decide who is President if the results are contested. So, then the winning vote for Trump was possibly Antonin Scalia in a split decision. Scalia was found dead with a pillow over his face under mysterious circumstances. No autopsy was ordered for one of the most powerful individuals in the world who died in any matter, not one that looks like an obvious assassination. Are 41% of Hillary Clinton's twitter followers fake? To what extent is the fraud? On this LIVE Black Friday, Nov. 25 edition of the Alex Jones show, we discuss the attempt by Green Party activist Jill Stein to steal the presidency from Trump by demanding recounts only in states where Trump won. Citizen-journalist Mike Cernovich reveals what's going on. Also, social commentator Mark Dice breaks down America's consumer culture and zombie reaction to Black Friday sales.